Baby Bowser Broadside is a 2-vs-2 minigame found in Mario Party 3. 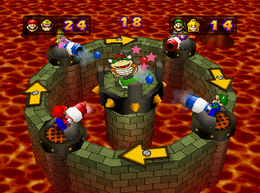 Teams at the outside border have to shoot the Baby Bowser target in the middle by using their cannons to get points. The Baby Bowser target moves randomly, and so does the player's cannons. The team who has the most points wins. Game Rules – "Aim your cannon at the Baby Bowser target, then fire away!" Advice – "The Baby Bowser target moves about randomly. Aim your cannon carefully and shoot to win." French À vos Canons! To your Cannons! German Baby Bowser-Breitseite Literal translation. This page was last edited on November 9, 2017, at 20:24.